Does the choice of regrind mill and mill media affect downstream performance? There has been much discussion recently on the relative energy efficiencies of various comminution machines, and this is as it should be, as comminution is such a high consumer of energy. But does the type of particle breakage mechanism have an effect on subsequent processes, notably flotation? This is the subject of an interesting paper by workers from Australia's JKMRC, recently published in Minerals Engineering. Stirred mills have been widely used for regrinding, and are acknowledged to be more energy efficient than tumbling mills, but these two types of mills present different particle breakage mechanisms during grinding. In the study, the effect of regrinding by both mills on surface properties and subsequent mineral flotation was studied, using chalcocite as the mineral example. A rod mill and a stirred mill with the same stainless steel media were used to regrind rougher flotation concentrates. Different chalcocite flotation recovery was achieved in the cleaner stage after regrinding in tumbling and stirred mills. The factors contributing to the different recovery included particle size, the amount of created fresh surfaces, surface oxidation and the redistribution of collector carried from rougher flotation. It was determined that the predominant factor was the different distribution of collector resulting from different particle breakage mechanisms in the stirred and tumbling mills. In the tumbling mill, the impact particle breakage mechanism predominates, causing the collector to remain on the surface of newly produced particles. In the stirred mill, the attrition breakage removes collector from the surface, and decreases particle floatability. Furthermore, the type of grinding media in the stirred mill also influences the subsequent flotation, again due to the change of particle breakage mechanisms. The chalcocite flotation recovery was improved by the addition of more collector in the cleaner stage. More collector addition was required after regrinding in the stirred mill than in the rod mill to restore the flotation recovery to the same level. The authors conclude that the selection of regrinding mills and grinding media should not only depend on the required energy efficiency, but also on the properties of the surfaces produced for subsequent flotation. But what do you operators think? How significant do you think this effect on downstream performance might be compared with the economics of energy consumption? Has anyone else researched or observed the effects mentioned in the paper? To me it is another good example of how comminution and flotation are inextricably linked. 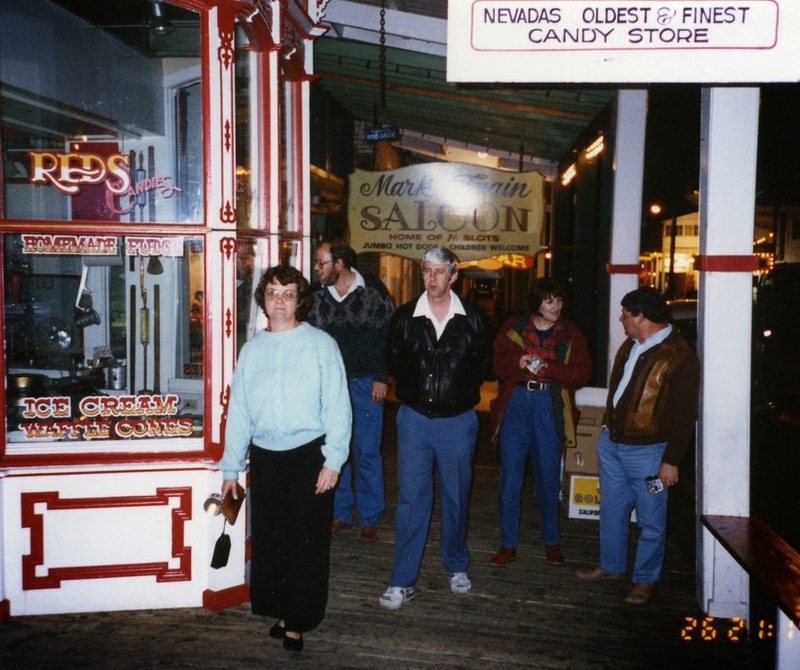 Twenty years ago today Minerals Engineering '94 began at the Hyatt Regency Resort, Incline Village, Lake Tahoe, Nevada. 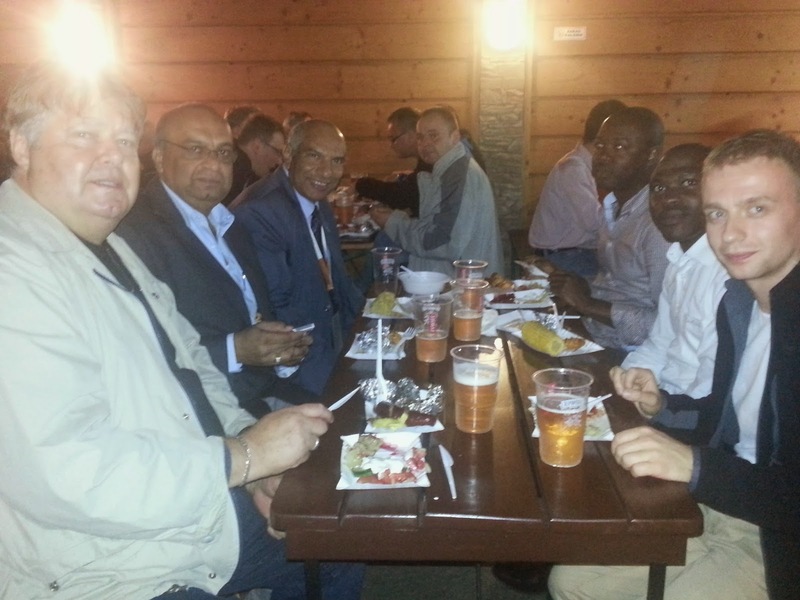 It was the 4th in the series of conferences organised by CSM Associates Ltd and Minerals Engineering journal, and was attended by 80 delegates from 23 countries, some of whom are sadly no longer with us, some who are still familiar faces at MEI Conferences, and others who have just slipped under the radar. 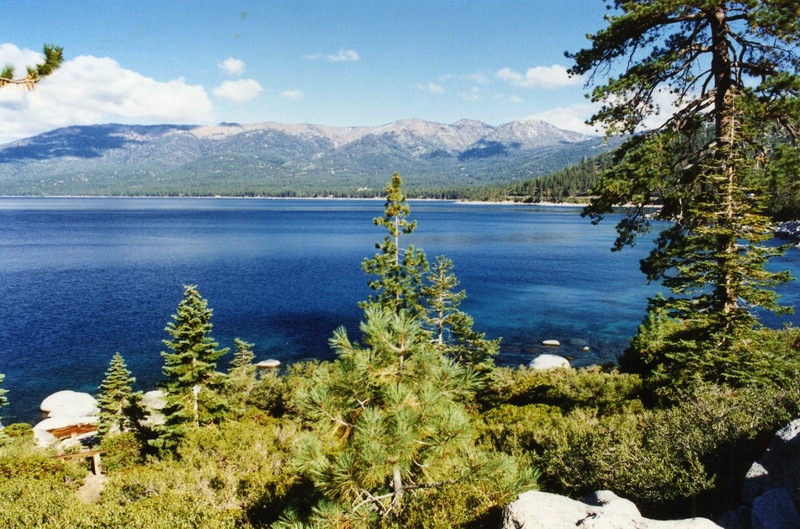 The nearby University of Nevada Reno collaborated with us, and the wonderful Lake Tahoe venue was suggested to us by the late Prof. Ross Smith of the Mackay School of Mines at Reno. The mining industry was in one of its regular periods of crisis in the mid-90s, with primary mining under great pressure, notably from environmentalists. The perception that mining is a source of pollution in every form was inhibiting the development of mining in the Western world to such an extent that it had been suggested at the previous year's SME that a future ban on all mining activities in the USA, apart from coal, could be envisaged. In Europe opportunities in primary mining were mostly in the east, particularly in the old Soviet Union, where environmental legislation was not so intense. It was felt that primary mining was unlikely to satisfy the increasing demand for minerals, and that there would be an increasing need from minerals from secondary sources, where the physical, chemical and biological techniques can be used to extract metals and minerals from polluting wastes, despoiled land, industrial and domestic waste etc. This has certainly proven to be the case, and was the reason for MEI instigating our sustainability conferences (see posting of 14th July 2014). Hazen Research, Inc., a company with a high international profile on the environmental scene, sponsored the conference, and the first keynote lecture at the event "Minerals Engineering in the Environmental and Recycling Industries" was given by Erik Spiller, the then Vice President of Hazen Research and President of A.R. MacPherson Consultants, a joint venture of Hazen Research and Lakefield Research. Forty seven papers were presented and selected papers were published in Vol. 8 Nos. 1/2 and Vol. 8 Nos. 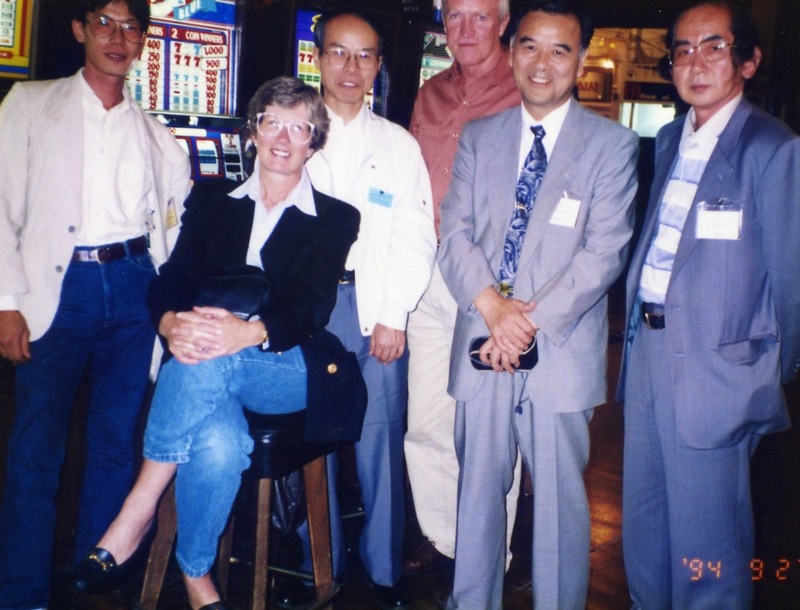 4/5 of Minerals Engineering in 1995. 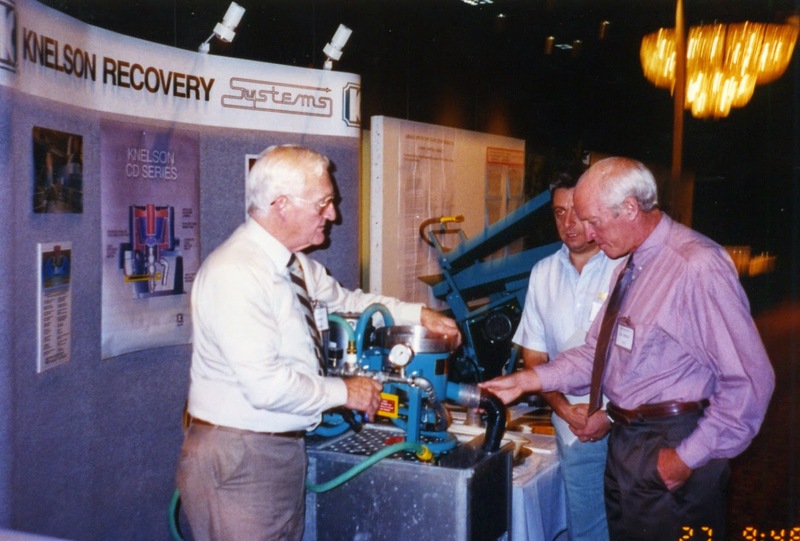 ﻿A few photos from Minerals Engineering '94 are shown below. MEC 2014- how was it for you? 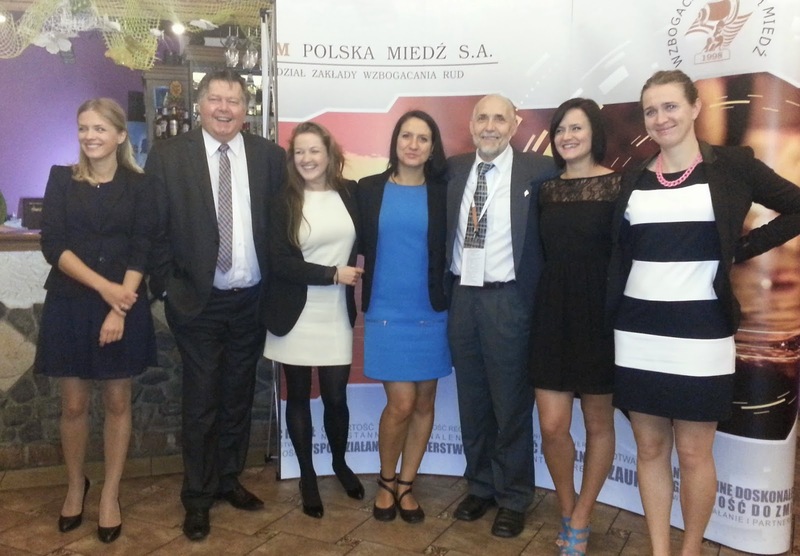 Amanda's daily reports on the Minerals Engineering Conference in Poland (Monday, Tuesday, Wednesday) have really captured the friendly atmosphere of this event. Now it is time for your say. If you attended the conference, let us have your views on the papers, organisation, highlights etc. This morning started with a poster session which lasted an hour, followed by a return to parallel sessions; one on mineral processing and one on the physicochemical aspects of mineral processing. I'll hold my hands up and admit that I didn't attend either session as I was busy writing the blog, but Kwang-Suk You, of the Korean Institute of Geoscience and Mineral Resources, won 'outstanding presentation of the session' for his paper on “Phase transformation of coal gangue with the addition of Na2CO3 during combustion” and Radoslav Plackowski, of Poznan University of Technology, won in his session with “Transport metali przez polimerowe membrany inkluzyjne wykorzystaniu 1-decylo-1,2,4-triazolu jako przenosnika”, which roughly translates (thank you Google translate) as “Transport of metals by the use of polymeric membranes inclusion of 1- decyl- 1,2,4- triazole as a conveyor belt”. There followed the closing ceremony, with the “outstanding presentation of the session” awards for today being handed out. My apologies to the winners from Tuesday's sessions, their awards were given out at the Gala Dinner when I didn't have my notebook. 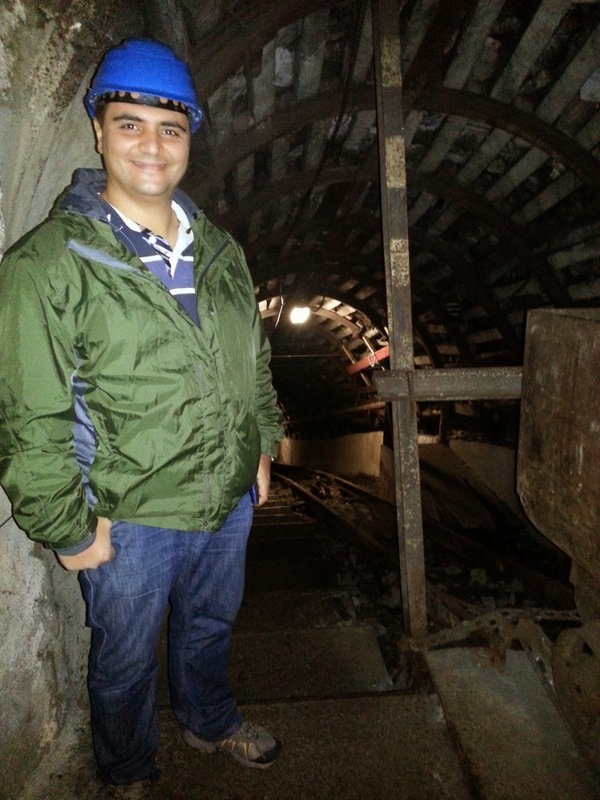 Marcin Lutynski invited us to attend next year's Minerals Engineering Conference, which will commence in Krakow, Poland on September 14. We then sat down to our last lunch together, and I chatted with C.K. 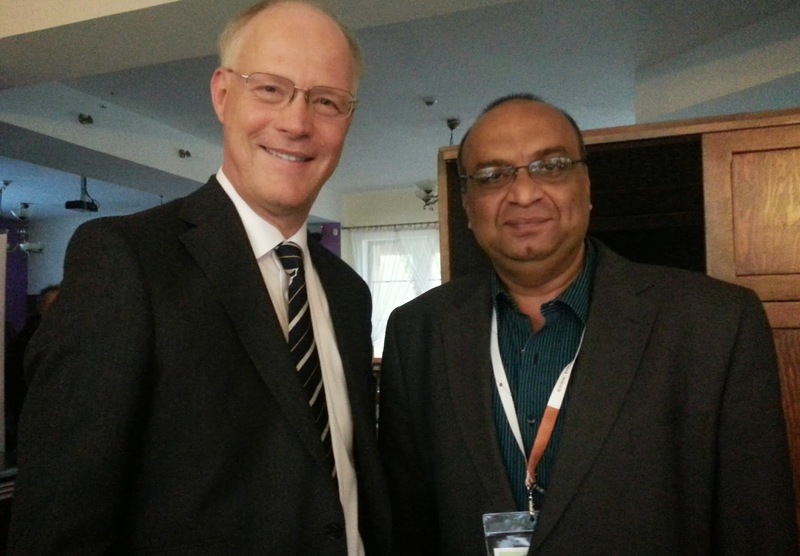 Asani, of Indian Rare Earths Ltd, the sole Indian delegate. He told me that he had travelled to Poland in search of help with the commercialisation of his patent, “Electrostatic separators for heavy mineral separation”. According to C.K. It could lead to the elimination of froth flotation in the processing of heavy minerals. Then there was nothing left to do except say our goodbyes and board the minibus back to Gwilice. In summary, although there were some teething problems with timings at the start, these were overcome by day 2, and were more than compensated for by the friendly atmosphere which pervaded this event. I feel like I have come away from MEC 2014 with a host of new friends as well as a new understanding and warm regard for the Silesian region of Poland. Hopefully I will be back for MEC 2015! 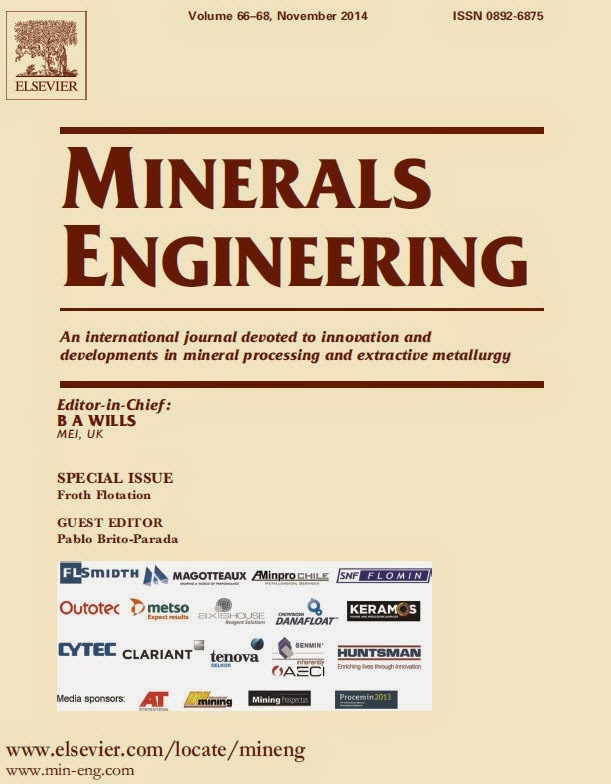 Around 100 papers were presented at Flotation '13 last November, and 30 of these have been peer-reviewed and published in Volumes 66-68, a special Froth Flotation issue of Minerals Engineering, now available for download on ScienceDirect. The special issue contains a Foreword from Guest Editor Dr. Pablo Brito-Parada of Imperial College, UK. 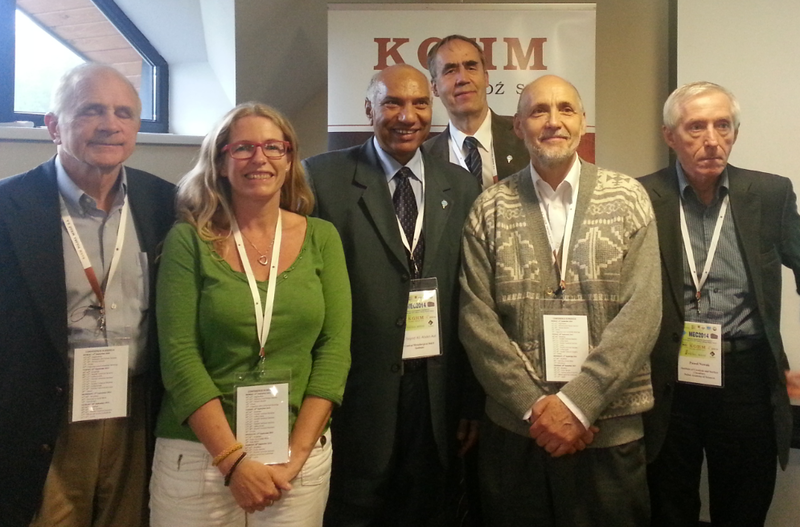 Flotation '15 will be held in Cape Town in November 2015 and again will provide speakers with the opportunity of presenting their work to an elite international audience, as well as having the opportunity of publishing the work in the world's leading mineral processing peer-reviewed journal. 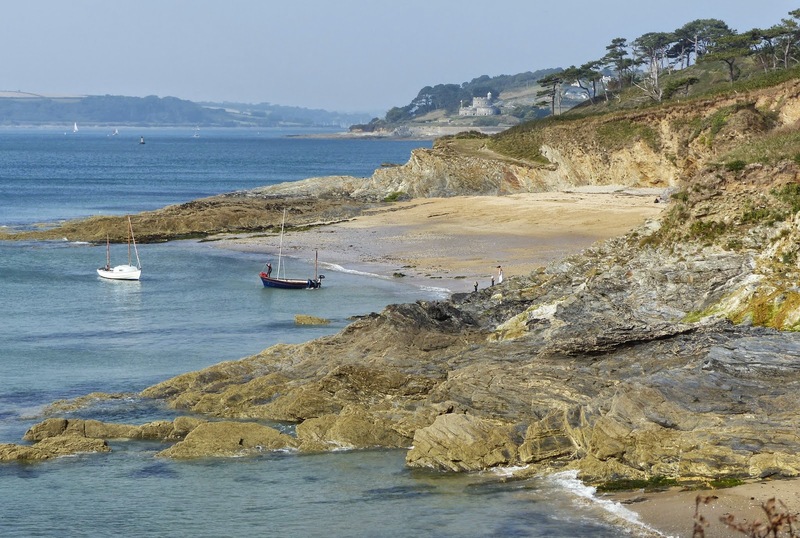 Cornwall's Roseland Peninsula is tantalisingly close to Falmouth, being the next stage in the eastern journey along the Cornish coastal path. 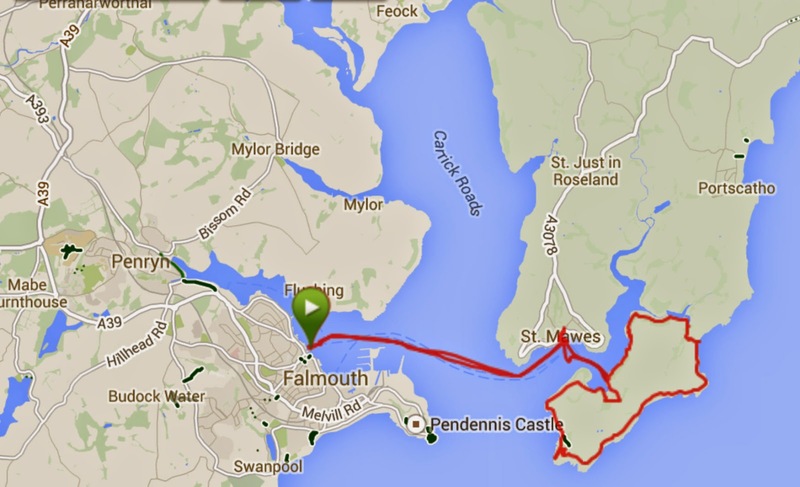 However to get there means crossing two rivers, the River Fal and its small tributary the Percuil River. 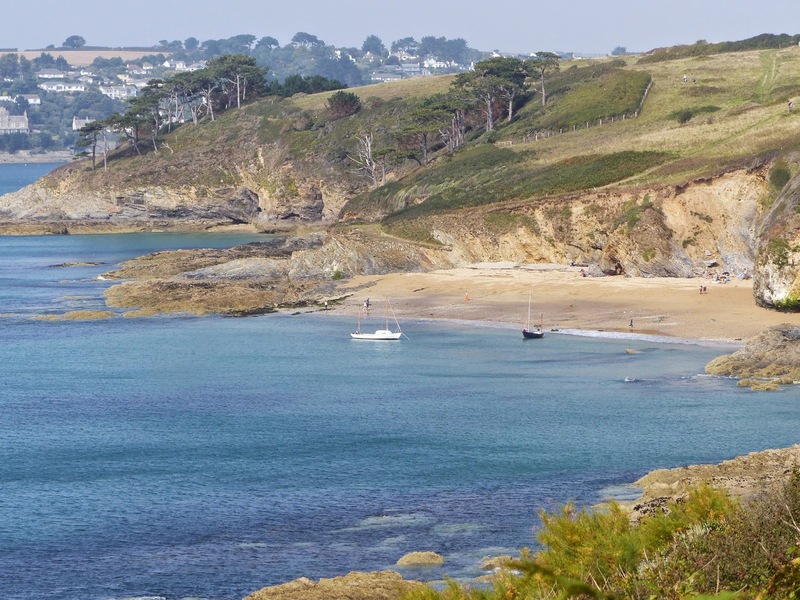 However, if you are not deterred by this you will be rewarded with Falmouth's best day out, with some of the finest coastal scenery in the whole of the county. Our journey last Sunday started at the Prince of Wales Pier, less than a mile walk from Falmouth's main Gyllyngvase Beach and the MEI Conference venue, the St. Michael's Hotel. At the pier we bought return tickets for the ferry journeys to Place, and the start of an outstanding day out. 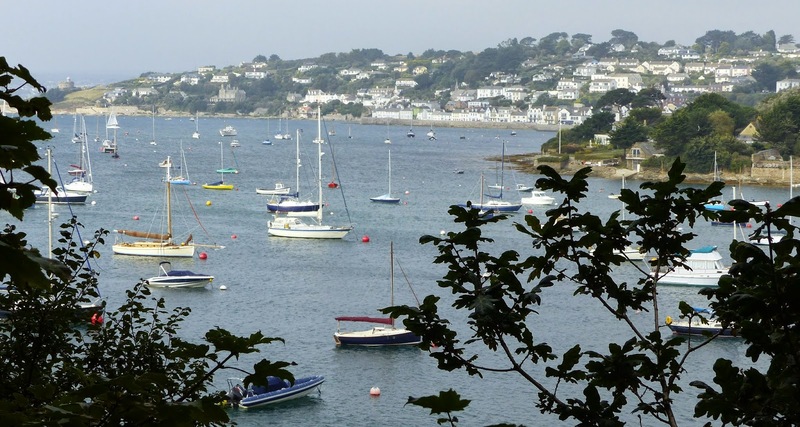 The 3 mile ferry journey to St. Mawes took us across the Carrick Roads, the name given to a section of the River Fal which forms a large waterway, created at the end of the last Ice Age when sea levels rose dramatically and created a huge natural harbour. The Carrick Roads is a classic drowned river valley and the entry to this, the world's 3rd largest natural harbour, is guarded on either side by the Tudor castles Pendennis and St. Mawes, built in the early 16th century in the time of Henry VIII to defend against expected invasions from Spain and France (see also posting of 4th April 2012). Arriving in picturesque St. Mawes harbour, you may wish to stop for refreshment before taking the short crossing to Place on the Roseland Peninsula. There are a number of walks from Place but we decided to opt for a 6-mile circular walk, graded 'moderate' due to the overall ascent of over 900 feet. Taking the shaded footpath to Porth Farm, we followed the Percuil River eventually reaching the coast path at Towan Beach on the eastern side of the Roseland Peninsula. 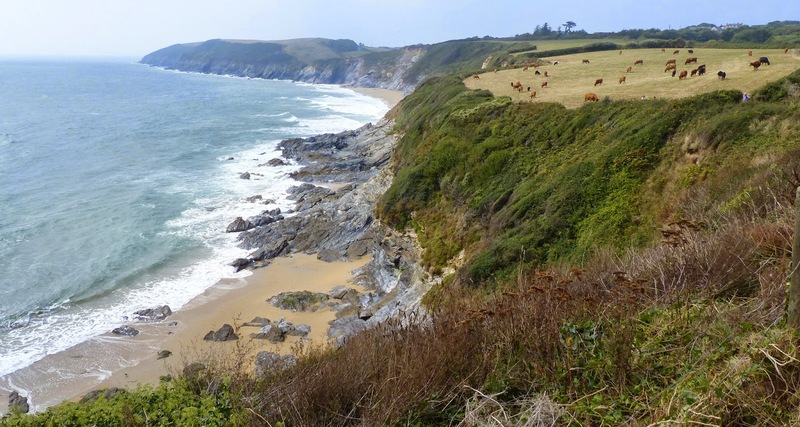 Towan Beach was good place to stop for lunch, sheltered from the easterly wind by the raised beach, a reminder of once higher sea levels. 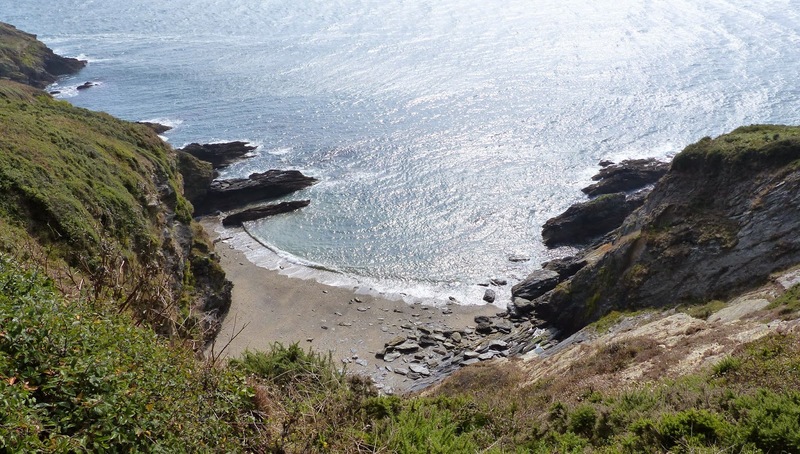 The footpath to Zone Point, the most southerly tip of the peninsula was almost deserted, as this is a remote area for many walkers, but the cliff scenery was magnificent, with precipitous vertical drops to the rocks 200 feet below. Rounding Zone Point the views across the Carrick Roads to Falmouth and St. Mawes were spectacular, as was the scenery on the western side of the peninsula, particularly around St. Anthony Head and the walk through pine woods passing the beautiful Great Molunan Beach. From there it was an easy return to Place, to catch the first of the ferries back to Falmouth, and the end of an outstanding day. 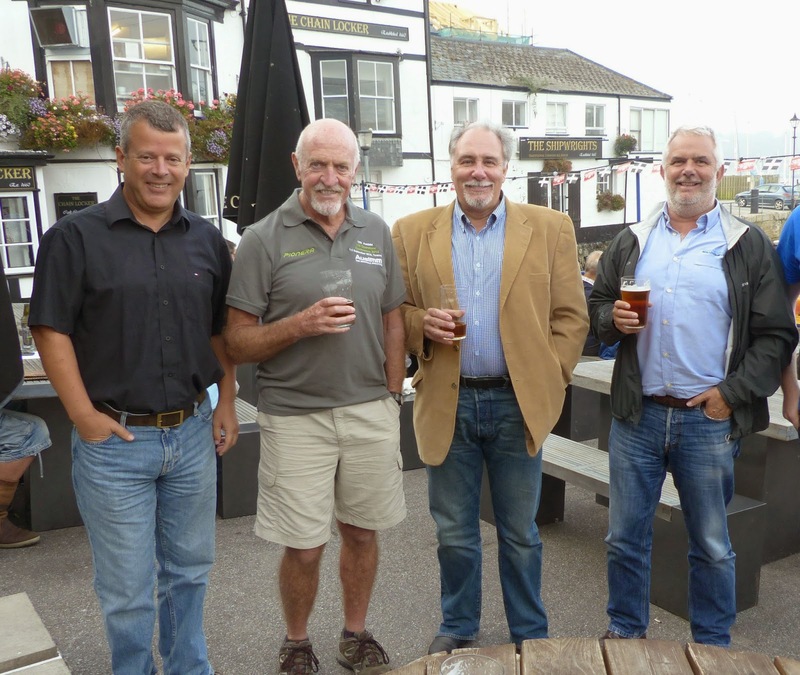 A low turnout of only about a dozen people last night at Falmouth's Chain Locker pub, for the September Cornish Mining Sundowner. 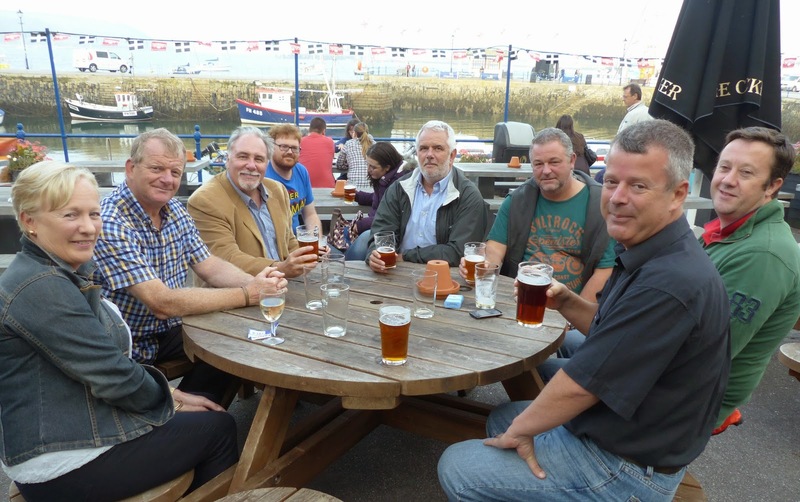 A pleasant surprise, however, was the appearance of Mike Hallewell of SGS, who I have not seen for several years, and two Metso men, Andrew Wilkinson, and Shane Sullivan, Shane making his debut at the sundowners (he is 2nd left on the photo below). And I am pleased that the Devon Mining Sundowner, just across the border, is beginning to take shape. Charlie Northfield of Drakelands Tungsten Mine has sent me the photo below taken at the Sundowner held at the Miners’ Arms, Hemerdon village, on 5th September. Current employees from Wolf Minerals enjoyed the company of three former AMAX Hemerdon employees. Left to right on the photo are Roger Craddock, AMAX Project Manager, Don Seymour, AMAX Accountant, Rick Taylor, Wolf Mine Planner, David Howourth, Wolf Health, Safety and Training Manager, Mrs Julie Taylor, Tony Delany, Wolf Process Plant Superintendent, Andrew Sarosi, AMAX Chief Metallurgist, Henry Chalcraft, Wolf Environmental Officer and Barnaby Hudson, Wolf Environmental Manager. The next Devon Sundowner will be held in the Miners' Arms, Hemerdon, on Friday 3rd October, starting at 5pm. And more good news today from across the border, this one 500 miles away. The sun will not be going down on the UK just yet! 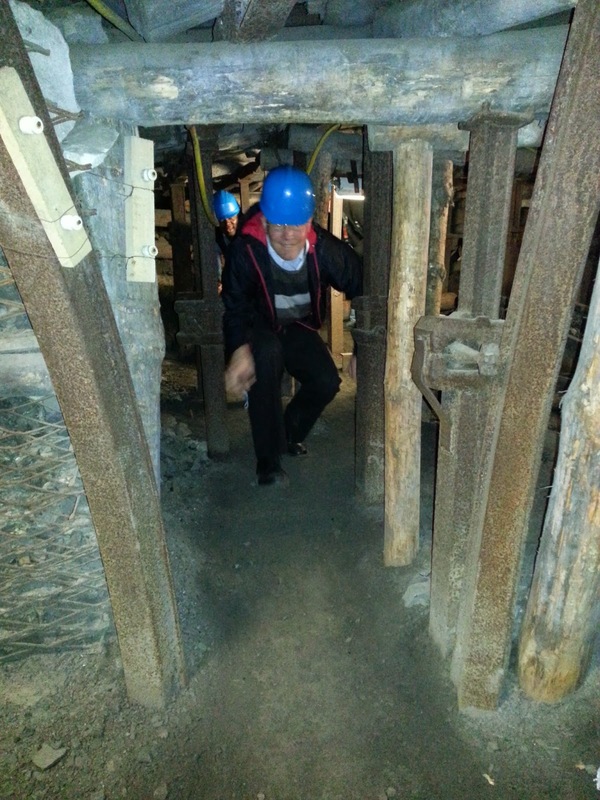 The third day of the MEC 2014 conference saw a break from the technical proceedings, with a visit to the historic Guido Mine. Founded in 1855 by Count Guido Henckel von Donnersmarck, the last coal was extracted in 1928, and during the 1960s-1980s it was an experimental mine. It has been open to tourists since 2007 and is the deepest tourist route in a coal mine in Poland. 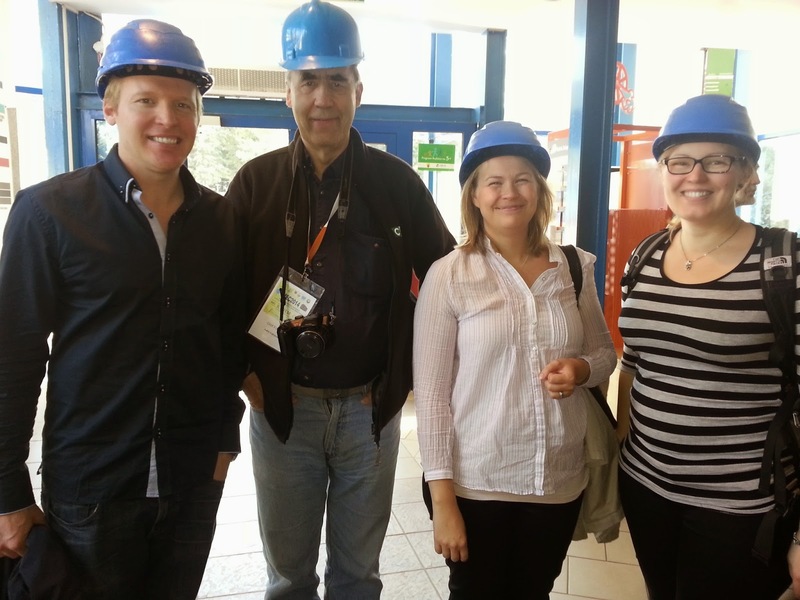 Whilst waiting for the coach to take us to the mine, I chatted with Antii Kekki, of Aalto University, Finland. Antii is a PhD student working with Prof Olof Forsen and told me that this was the second time he has attended the Minerals Engineering Conference – which is now in its 51st year. I asked him how he was finding this one and he told me that he was enjoying it; the papers are interesting, the food is good and he also enjoys the friendly atmosphere. Once we had descended to level 320 (320m deep) in the original mining cage at a speed of 4m/s, our guide led us on a 2.5km route around the mine. 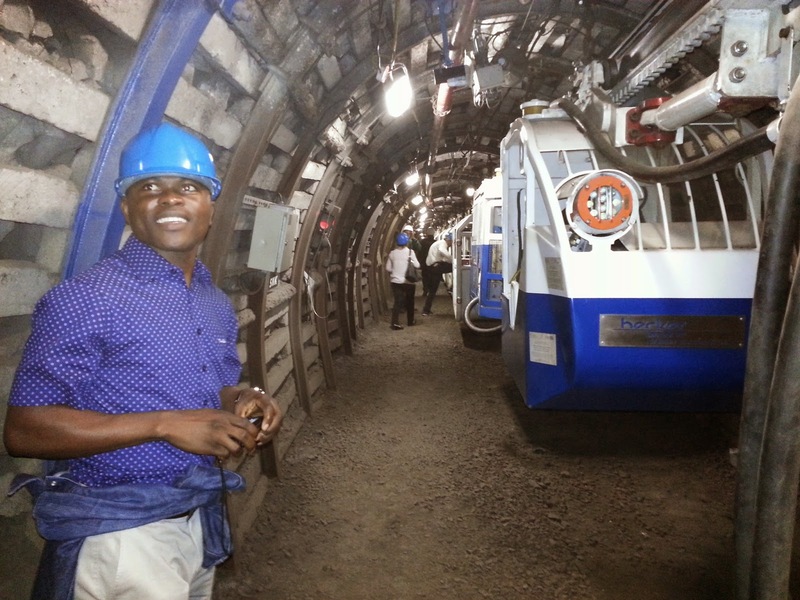 During our trip, we were able to view some of the large scale mining equipment in operation, giving us an idea of the conditions in which the miners worked. Hint: it was very noisy and dark! 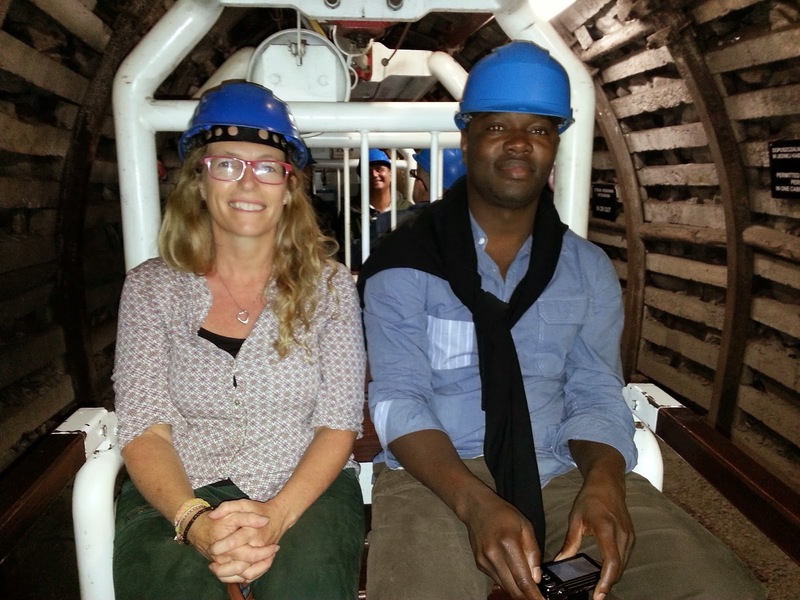 One of the highlights of the tour was getting to ride in the electric suspension mining railway, the only one of its kind in the world which is open to tourists. 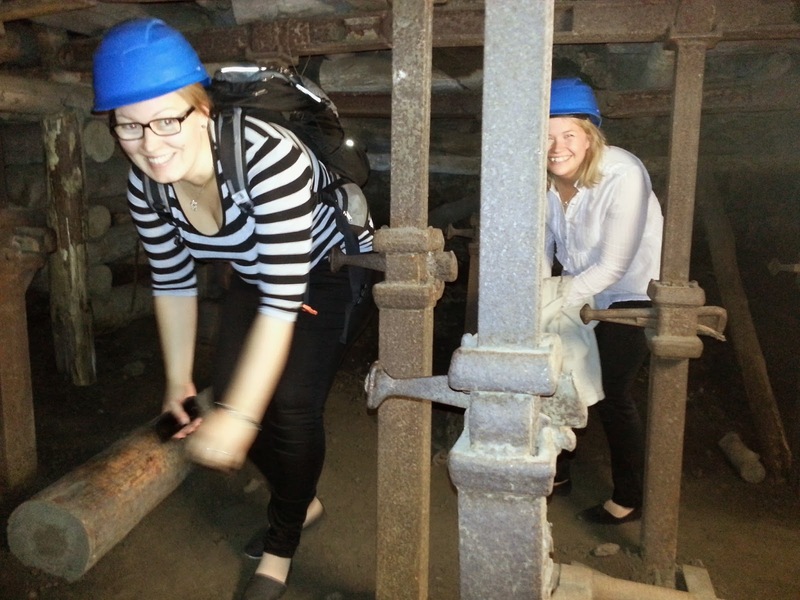 We also got to experience the working condition by 'walking' through one of the side tunnels. One of the few times I'm glad to be on the short side! 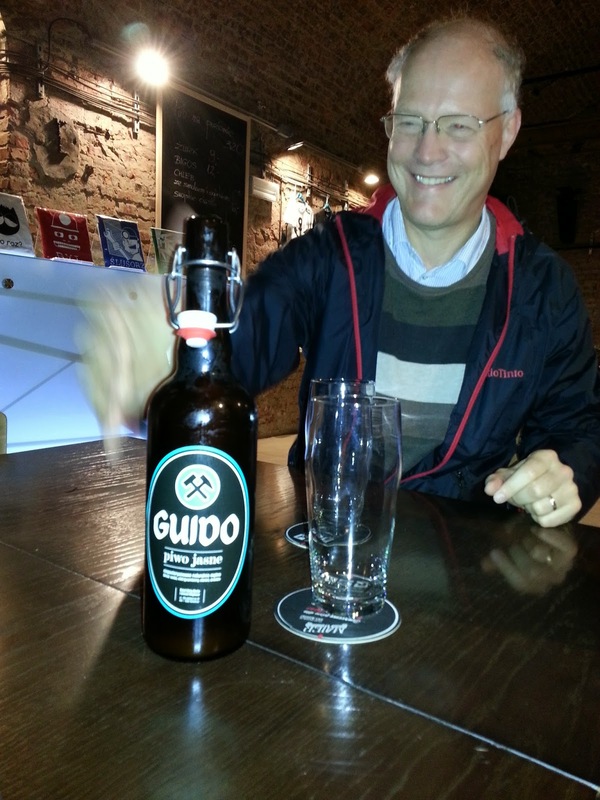 To end our tour, we were pleasantly surprised to be shown to an underground bar, where we were able to sample Guido, the mine's own brand of beer. We left the Guido mine and travelled to another old coal mine, this time for lunch. 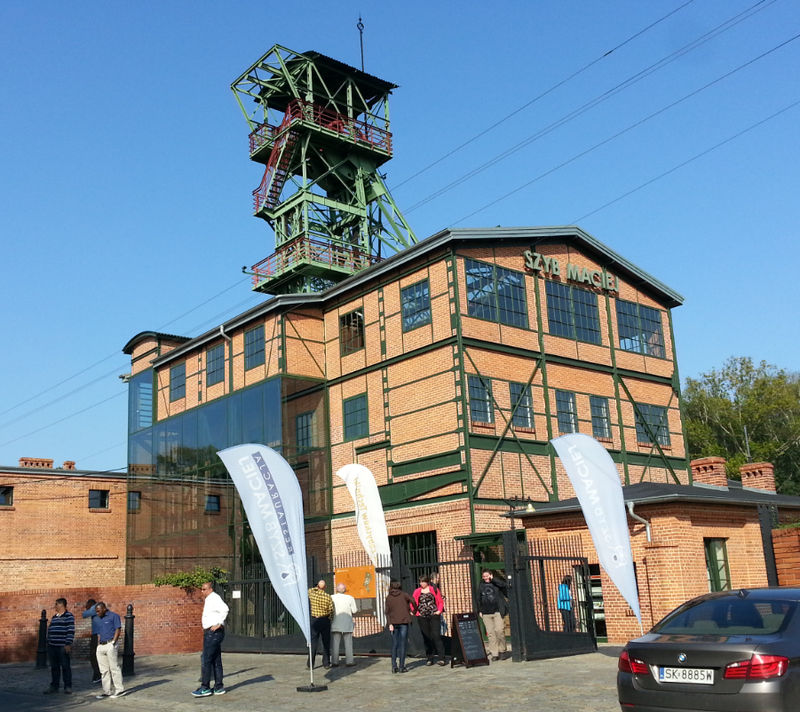 The Szyb Maciej restaurant in Zabrze is located in the shaft of the former Concordia mine. The interior is an interesting and beautiful mix of old and new, with traditional Silisean food being served. After travelling back to Istebna, we had a little spare time before gathering again for the Gala Dinner. 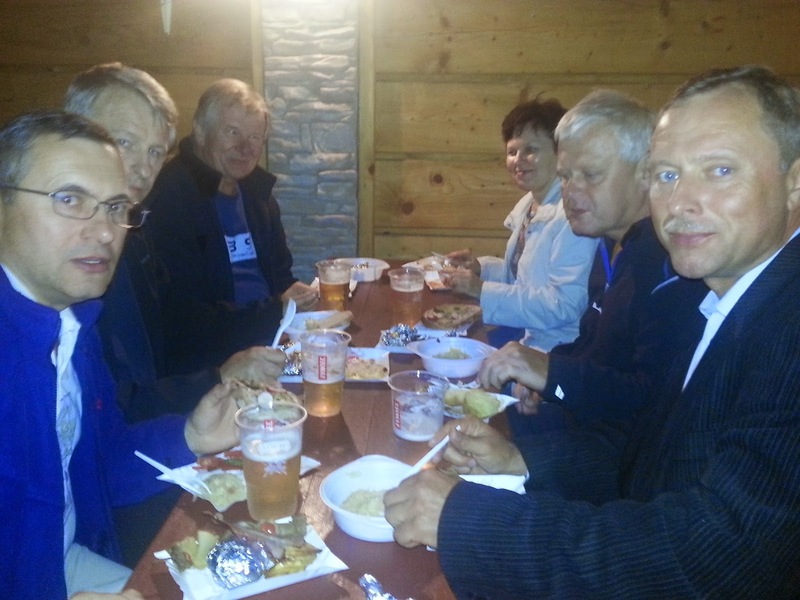 During dinner, I was introduced to the Polish tradition of drinking neat vodka with my meal, accompanied by much toasting. As vodka is a favourite drink of mine, this was not a problem and I was treated to a lecture on the origins of the 'Zubrowka' (translation: Bisson) vodka we were drinking from Jan Drzymala. Over dinner I was introduced to Dr Lukasz Nieradko, Business Development Director at the newly formed Wroclaw Research Centre. The Centre will work as a technology transfer company for Wroclaw University of Technology. There wasn't much time for work-talk though, as soon the dancing began. I left at 1am, but I think some people were just getting started! Today the conference ramped up a gear, with parallel technical sessions running all day. The morning saw two sessions on mineral processing, one on hydrometallugy and one focusing on the physicochemical aspects of mineral processing, while the afternoon focused on new challenges in mineral processing and more physicochemical aspects of mineral processing. 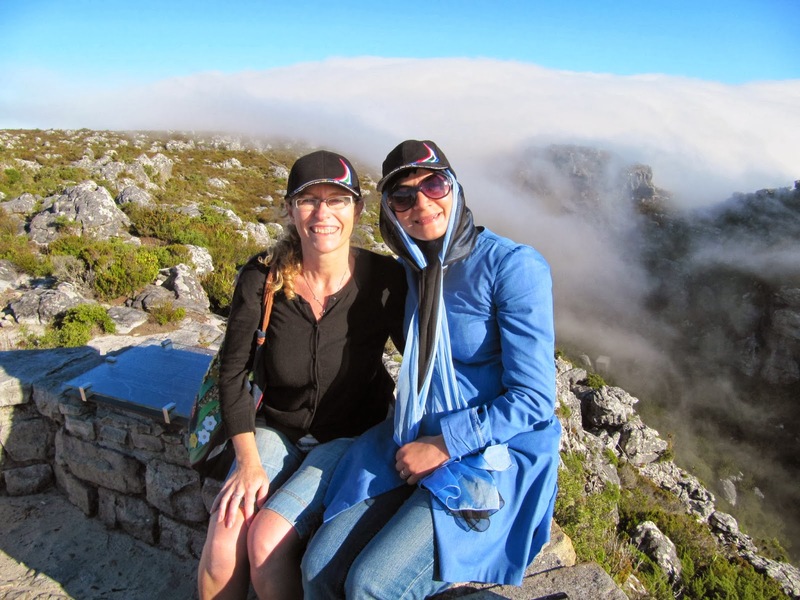 Some delegates also found time for meetings whilst enjoying the magnificent views. 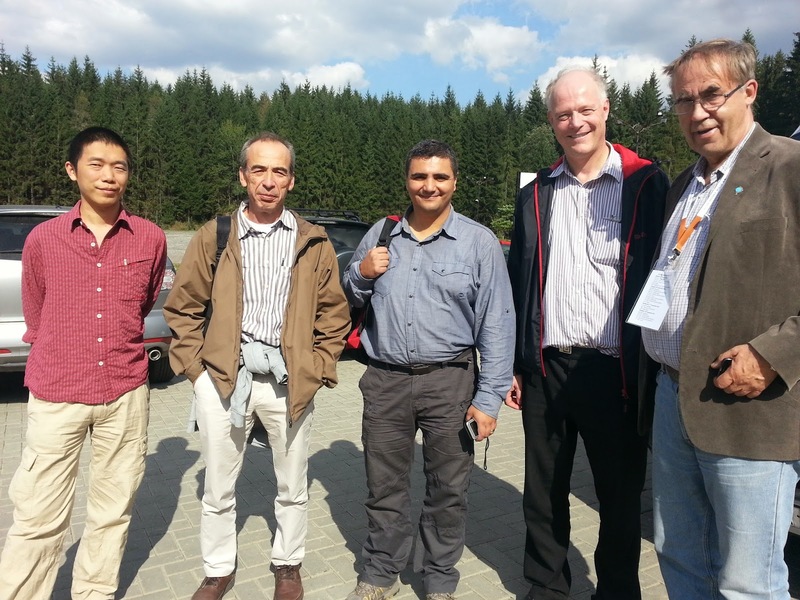 Prof Tadeusz Tumidajski, Dr Tomasz Niedoba, and Dr Barbara Tora of AGH University, Bozena Spalinska of KGHM, and Dr Bozena Skorupska and Dr Andrzej Wieniewski of the Institute of Non-Ferrous Metals are working together to develop a project concerning the development of a monitoring system for hydrocyclones at KGHM. Of course, all work and no play is no fun at all, so after the morning's coffee break I teamed up with Zhihai Luo for a walk to the top of the mountain, as I'd promised myself I'd do yesterday. 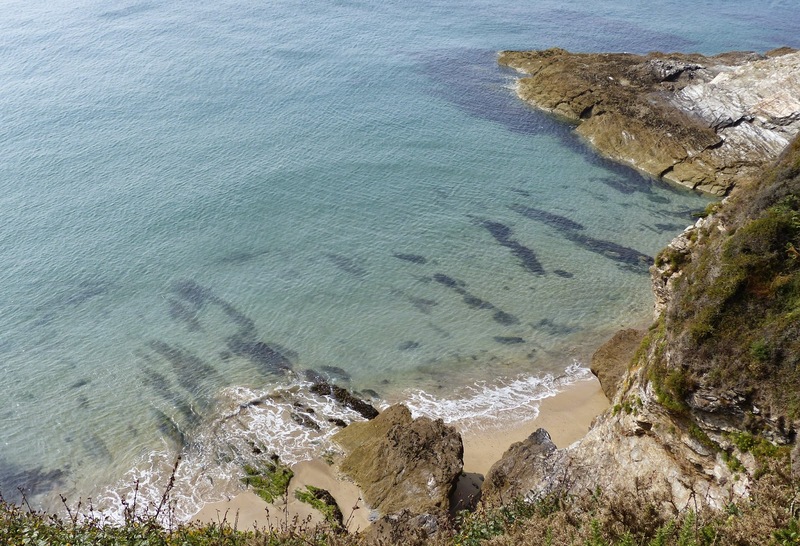 With the temperature reaching 28C it was a sweaty walk, but the views from the top were worth it! I spent lunch with a group from Wroclaw University of Technology; Dr Danuta Szyszka, Dr Alicja Bakalarz and and PhD student Magdalena Duchnowska. 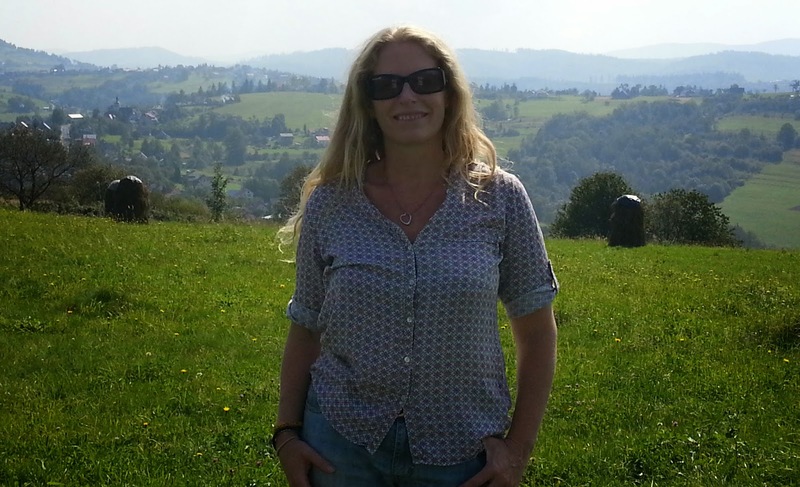 As well as being an Assistant Professor at the University, Danuta is also the editor of the journal Mining Science. All three told me that they were looking forward to attending the International Mineral Processing Congress in Chile next month, which Barry will also be attending in MEI's role as media partner. Immediately after lunch, the weather changed quite dramatically, with thunder, lightning, a heavy downpour of rain, and even some hail! 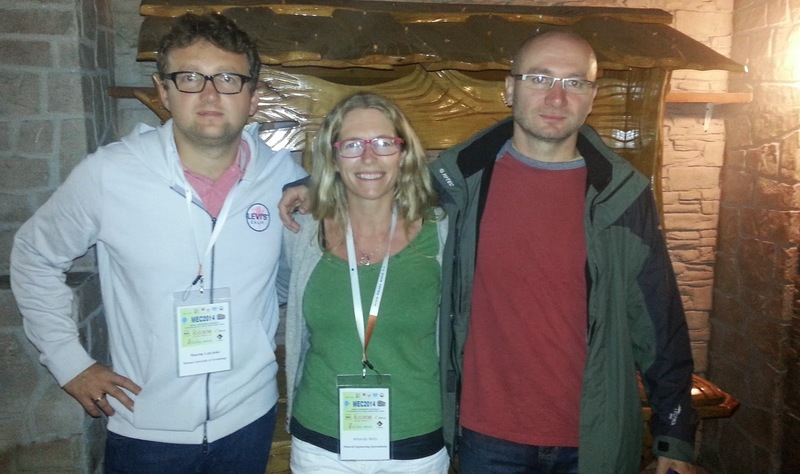 Whilst trapped under a large umbrella, I chatted with Amos Ambo and Dr Przemyslaw Kowalczuk of Wroclaw University of Tecnology. 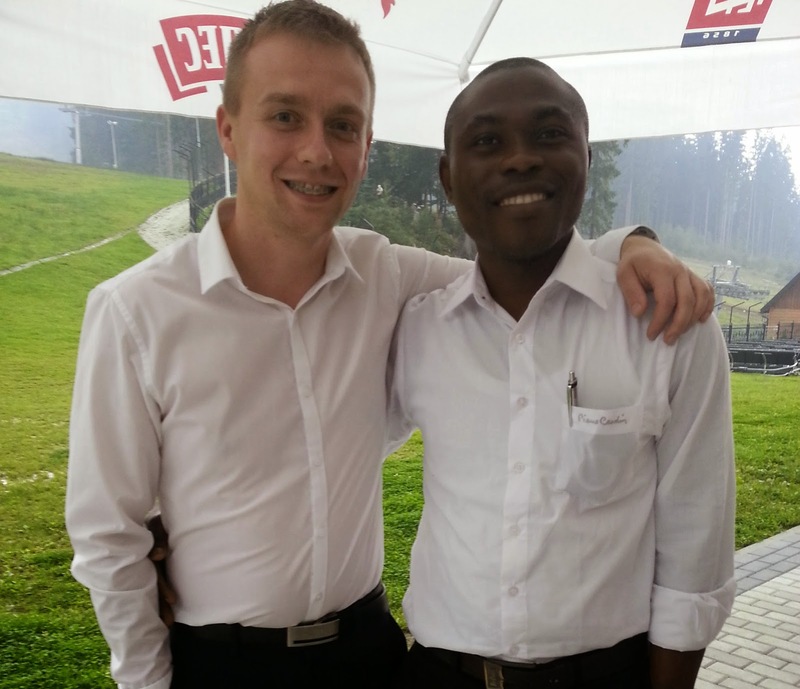 The two are old friends, from when Przemyslaw spent 6 months working as a research assistant at the Camborne School of Mines in 2012. I decided to sit in on a session on the physicochemical aspects of mineral processing. First up was Anna Latowska, of Gdansk University of Technology. 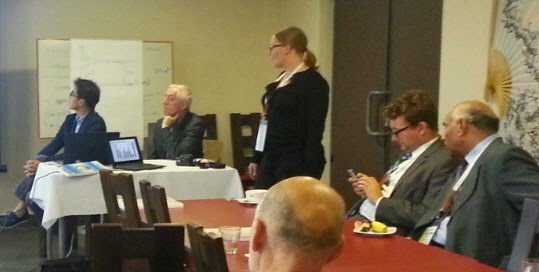 PhD student Anna presented “Micellar aggregation of Triton X-100 surfactant in imidazolium ionic liquids”. Anna was followed by Prof El-Sayad Ali Abdel-Aal, of the Central Metallurgical Research and Development Institute in Egypt, who presented “Enhancing filtration rate of New Valley oxidised phosphate concentrate with some additives”. 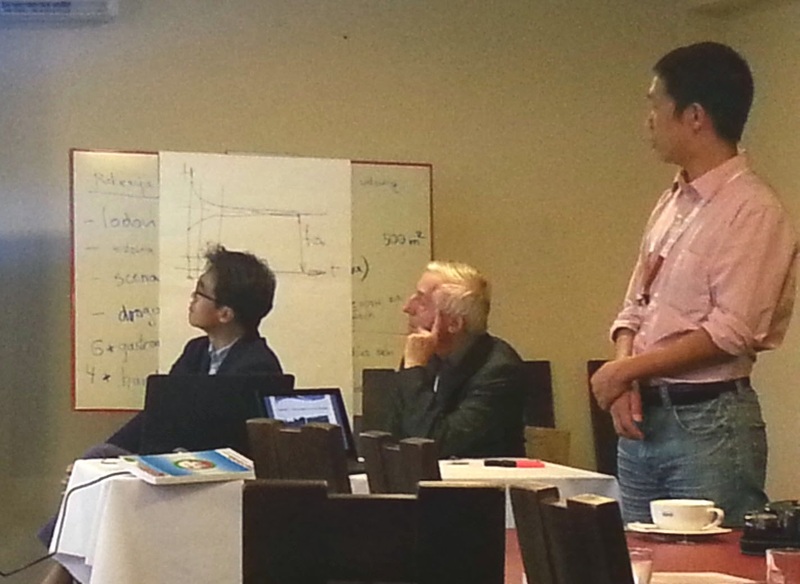 Then Shekwonyadu Iyakwari, a PhD student from the Camborne School of Mines, University of Exeter, presented “Strategy development for copper preconcentration using near infra-red sensors”. Last up before coffee was Katarzyna Kiegel, of the Institute of Nuclear Chemistry and Technology in Poland. Katarzyna presented “ Analysis of the possibility of uranium supply from domestic resources”. With half an hour for coffee, I crossed over to the other conference room for the 'New Challenges of Mineral Processing' session. There, I spoke to the group from Aalto University in Finland, Prof Olof Forsen with 3 of his PhD students: Lotta Rintala, Anna Stefanova and Antii Kekki. Lotta then went on to present an interesting paper on “Experimental work as a knowledge source in the gold ore process design”, concluding that published experiments can be used as knowledge sources in gold ore process design recommendations. She was followed by another PhD student, Zhihai Luo, who presented “The role of mineral processing in mine closure planning”, which focused on work carried out in the Carnon Valley, Cornwall, where I often go cycling! Copper, tin and arsenic were mined here and a lot of heavy metals have accumulated in the area. To finish the days technical proceedings, Dr Tomasz Chmielewski, of Wroclaw University of Science and Technology, presented “Recovery of cobalt and nickel in atmospheric leaching of flotation sulfide concentrate from Lubin concentrator”. 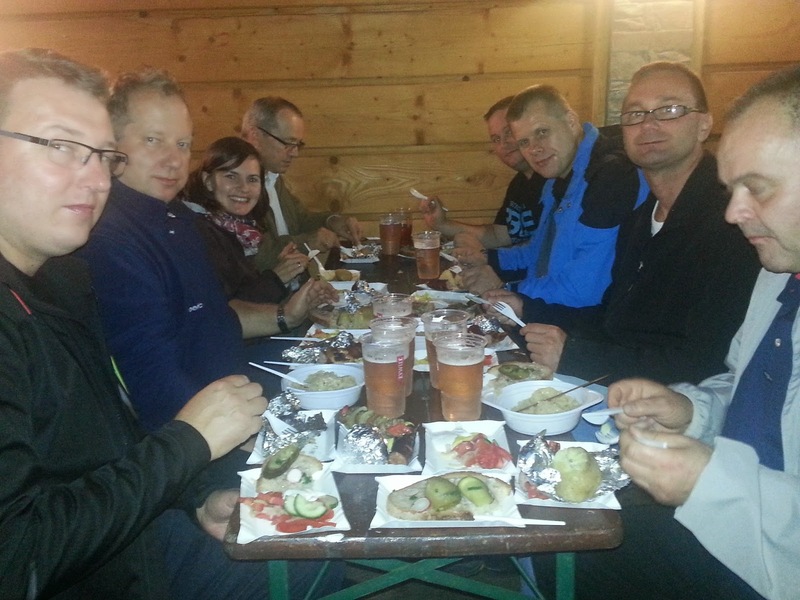 This evening the organisers laid on a BBQ of traditional Silesian food, with Polish beers on tap. 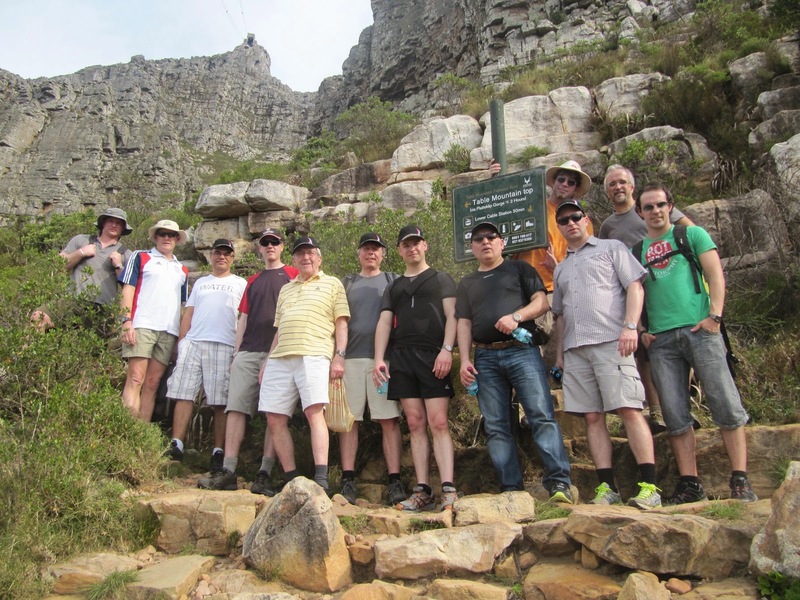 The Cornish coastal path walk is a regular feature of MEI Conferences in Falmouth, and in recent years the optional hike up Table Mountain has become established in the timetable of the Cape Town conferences. 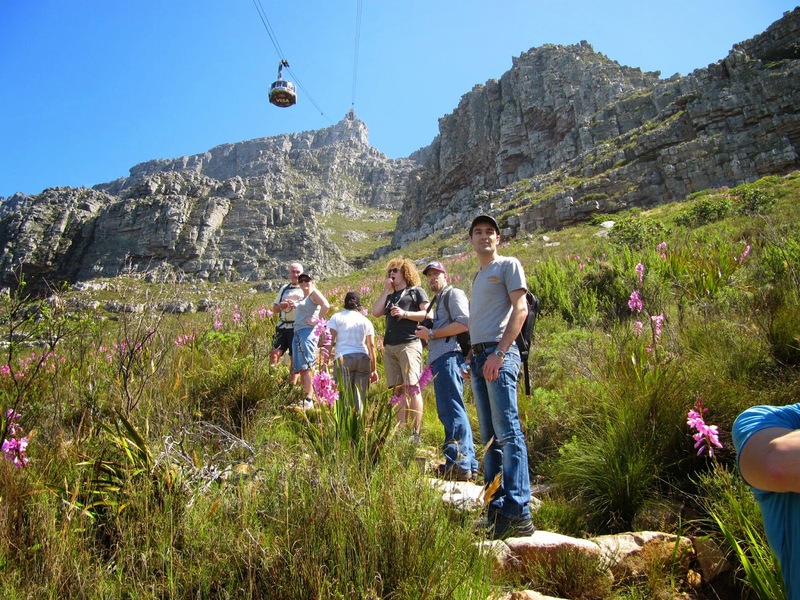 Although only a short walk in terms of mileage, the ascent of Table Mountain from the Lower Cable Way via Platteklip Gorge is a real tester, with a vertical ascent of around 700 metres, so do not undertake this unless you are a strong regular hiker. If you would like to join us after Process Mineralogy '14, we will be meeting in the foyer of the Vineyard Hotel on Thursday November 20th. 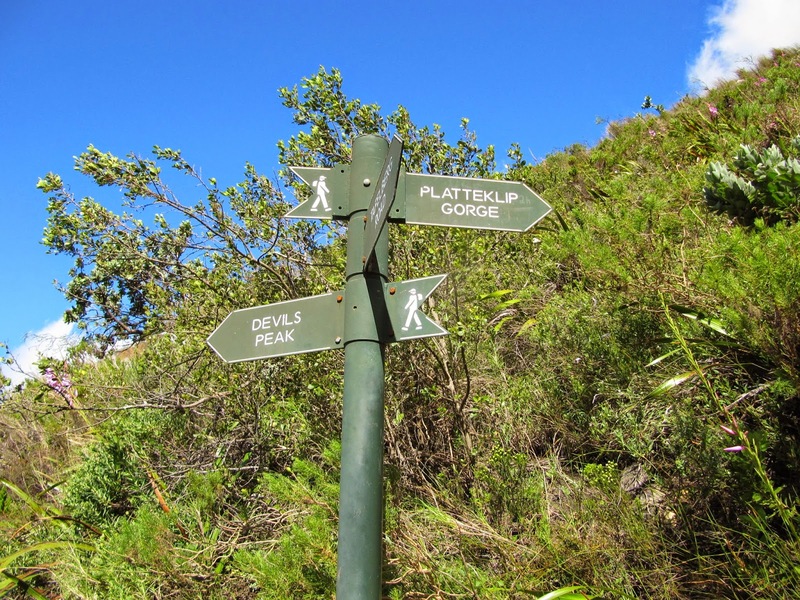 If you are an experienced hiker you probably do not need me to remind you that you must have suitable footwear and clothing, and that you must bring plenty of water. 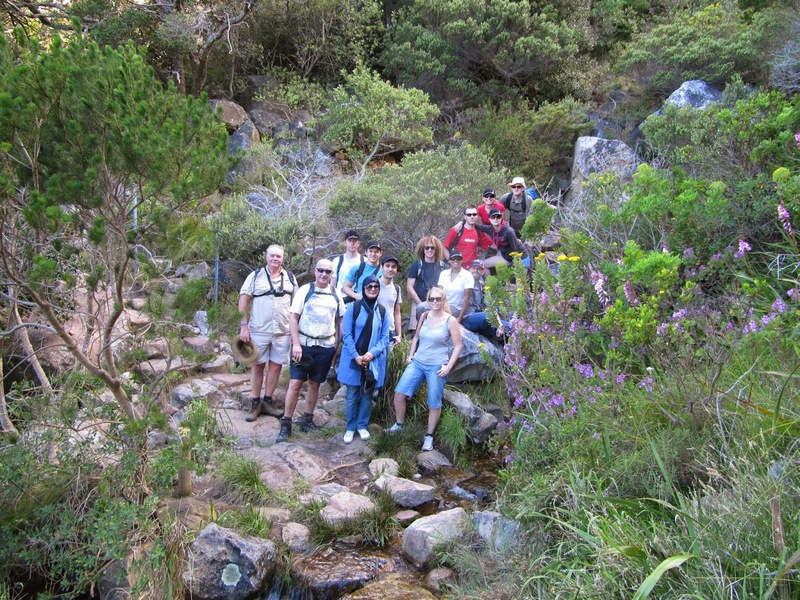 Photos from recent hikes are shown below, and you can also see a movie of our ascent last year with Flotation '13 delegates.